From my notebook of Art quotes- "Paint the emotional charge that interested you when you saw the subject" (Marian Guthrie). I fiddled with this canvas quite a bit before it had the feeling I was after. My attraction was the texture of the swamp-grass and the pattern's potential to play pinball with your eye and ricochet you into the space. I finally had to clear a path with light, but now I find it sufficiently entertaining. "Composition is just a way of taking the eye on a tour through a painting and pointing out things to notice along the way" [Working Out a Painting, Colleen Browning]. 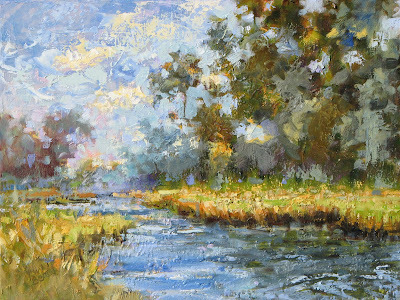 "Meandering", 9x12, Oil on gallery-wrap canvas. Well, you nailed it. The texture is great with interesting patterns. Did you use a palette knife? Such yummy variety in your colors! Love the way the finished painting far outdoes the original scene. Great quotes... shall try to keep them in mind. The painting has a perfect title. My eye likes the trip this painting takes me on. Excellent textures; and the colors compliment each other very nicely! Beautiful composition, Jill. I love the way the shore line water is shaped. It brings the eye deeper into the scene. I've been walking along the river here in Puerto Rico lately- though it's been raining. I enjoy the way the water fills up and widens across the land. (Don't worry- it's contained.) My cell phone photographs just don't quite capture the impact of the image. Used to live in Fl. Your work makes me miss the ability to set out the front door, feel the sun & smell the ocean. Nice work. This is such a great news, it really like this, Your blog is nice and informative. Thanks for the article. My first visit Jill! I like the colour and texture in this piece! I REALLY loved "The Bluff"... great transparent shadows and use of broken colour! 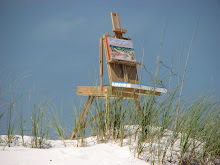 Your work reflects your outdoor experience and enthusiam for being "out there"! so I appreciate your thoughts. Yes, I use the knife a lot. Occasionally exclusively, but usually interchangeably. I find it keeps me from painting up-tight. (no brushes to clean up is a fun plus too). Teresa- thanks! Greens can get yucky... somehow this variation of grayed & olive, takes on a camouflaged effect. Your initial reaction means a lot and confirms my intentions... to share some information, but above all, the experience & enthusiasm of painting outdoors. It totally ping-pongs my eye. The other thing that I absolutely love here is the skyholes in your trees, how they integrate the background with the foreground. !!! love them. And the quotes are fantastic too. thanks for those. Exquisite! Love the golds and blues and that gorgeous texture of yours.